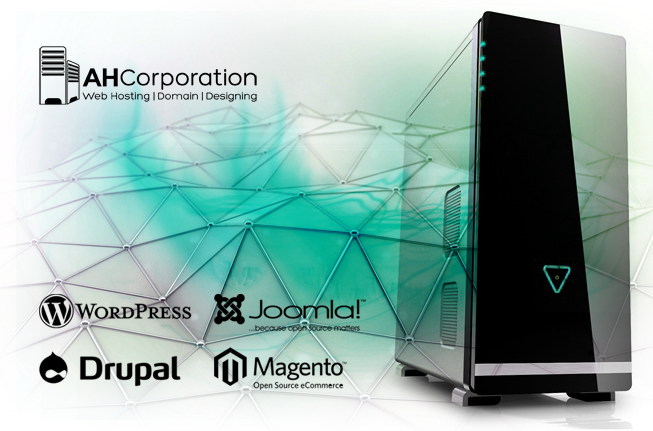 OUR WEB HOSTING SUPPORT POPULAR CMS! Drupal is content management software. Magento is the eCommerce platform trusted by the world’s leading brands. Create your online store with PrestaShop’s software. We offer WordPress based web design services usually use own custom and paid themes on client demand. Our web design and web development tools comprise CMS specially WordPress, Magento and opencart, we normally upload websites on our own fast and reliable web hosting servers and register domains as per client need. AH Corporation has skilled team to support you. Offering domain name registration in Karachi Pakistan, we are the top class domain web hosting provider in Pakistan and provides Pakistani domain names like .PK .com.pk .net.pk .org.pk, .biz.pk and so on. Provides hosting and cheap domain hosting in Pakistan. We offer affordable domain registration using payza as well and web hosting packages using payza merchant in Pakistan. Offer web hosting and domain registration in Karachi Pakistan at very affordable rates, we are the top class domain and web hosting provider in Pakistan, provide Pakistani based domain names i.e. .PK domain registration that may be available in some different extensions like .com.pk .net.pk .org.pk, .biz.pk etc. cheap rate domain name registration and web hosting in Pakistan. Our support web hosting and web designing staff always ready to help you in office hours i.e. 10am – 6pm, Mon – Sat PST (Pakistan standard time) on phone and email support and after this we are also available on email support 24hours a day, we always focus of good quality web hosting support and always use advance cpanel Linux based servers for good latency and better response time, our staff are always happy to give you full managed web and domain hosting services support. Offers php web hosting, .pk domain registration, domain hosting services on Linux cpanel based web hosting servers, Linux based managed cpanel servers are best to run websites based on wordpress / joomla / opencart etc, that fulfill need for clients searching for web hosting with linux cpanel php 5.6 or higher and mysql. We also offer windows based web hosting for websites uses ASP or ASP .net / asp dot net. We are one of the reliable web hosting company among 100s of web hosting companies in Pakistan also offer .pk domain registration Karachi Pakistan. Best rates domain registration services in Pakistan along with affordable rates best web hosting service on advance and fast Linux / windows based dedicated server in Karachi Pakistan. Send us your CV. Our HR department will contact you.